Tracy Canfield is a computational linguist whose short science fiction and fantasy has appeared in Analog, Strange Horizons, and many other magazines and anthologies. CNN called her a “Klingon scholar” when she recorded the Klingon version of the Jenolan Caves’ audio tour. Effie Seiberg is a fantasy and science fiction writer. Her stories can be found in the “Women Destroy Science Fiction!” special edition of Lightspeed Magazine, Galaxy’s Edge, Analog, and PodCastle, amongst others. She is a graduate of Taos Toolbox 2013, a member of Codex, and a reader at Tor.com. Effie lives in San Francisco, recently and upcoming (but not presently) near a giant sculpture of a pink bunny head with a skull in its mouth. She likes to make sculpted cakes and bad puns. Find her online at effieseiberg.com and on Twitter @effies. Stephanie is a professional fangirl by day and your friendly, neighborhood, not-quite-a-librarian staffing the circulation desk by night. 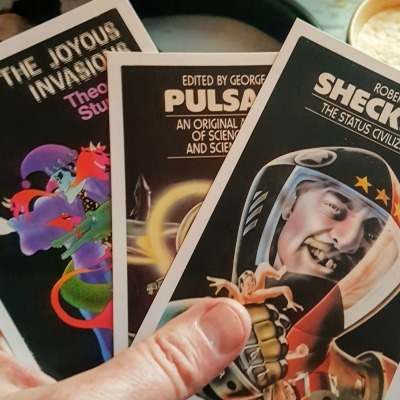 She has narrated short stories for PseudoPod, PodCastle, EscapePod, and Cast of Wonders, guest-blogged on subjects ranging from new books to zombie turkeys, and performed Shakespeare in a handful of weird churches. Until she suppresses her inner perfectionist enough to create a website, you can find her on Twitter at @smaliamorris. Last year, I was a Writers of the Future Contest Finalist and two-time Silver Honorable Mention winner. I’m a Zebulon Contest Mystery/Thriller/Suspense Novel winner for the Pikes Peak Writers and a novelrocket.com Launch Pad Novel Contest grand prize winner as well. My stories have been published in Havok Magazine and Chicken Soup for the Soul. Originally published in Analog, reprinted in The Mammoth Book of Time Travel SF. Paul Levinson, PhD, is Professor of Communication & Media Studies at Fordham University in NYC. His nonfiction books, including The Soft Edge (1997), Digital McLuhan (1999), Realspace (2003), Cellphone (2004), and New New Media (2009; 2nd edition, 2012), have been translated into ten languages. His science fiction novels include The Silk Code (winner of Locus Award for Best First Science Fiction Novel of 1999, author’s cut ebook 2012), Borrowed Tides (2001), The Consciousness Plague (2002, 2013), The Pixel Eye (2003, 2014), The Plot To Save Socrates (2006, 2012), Unburning Alexandria (2013), and Chronica (2014) – the last three of which are also known as the Sierra Waters trilogy, and are historical as well as science fiction. He appears on CNN, MSNBC, Fox News, the Discovery Channel, National Geographic, the History Channel, NPR, and numerous TV and radio programs. His 1972 LP, Twice Upon a Rhyme, was re-issued in 2010. He reviews television in his InfiniteRegress.tv blog, and was listed in The Chronicle of Higher Education’s “Top 10 Academic Twitterers” in 2009. Interview: Jonathan McDowell – Is this the end of the world! cosmology, black holes, merging galaxies, quasars, and asteroids. UK/US citizen. Educated in the UK, he moved to the USA in 1988. Minor planet (4589) McDowell is named after him. Octagon Technology provides Hosted Exchange Systems to businesses and organisations in the UK. With such a low cost and huge benefits, what’s not to love?